We arrive at another well maintained monument of this region. The care-taker cycles down the 300m stretch from Bhandalike temple complex and unlocks the gate for me. Datable to the times of Rastarkuta Krishna (Kannaradeva) the temple received endowments by one Jakkiyabbe who was ruling Bandalike in A.D. 912. The epigraphs dated A.D. 12000 and 1203 record that the Basadi was rebuilt by a merchant named Boppa Setti. The Santinatha Basadi in plan has a Garbhagriha, an Antarala, a four-pillared Mukhamandapa and a thrity two pillared Mukhamanadapa all in north-south orientation. 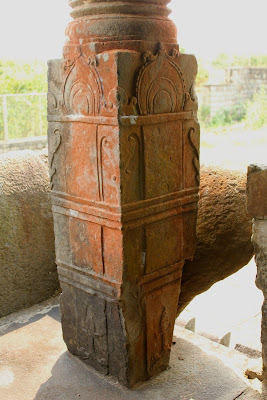 The Mukhamanadapa in its southern wall has the Devakoshthas on either side of the Sukhanasi doorway which is also provided with perforated Jalandras. The sanctum is Pancharatha on plan and is bereft of Jaina images. However, a few mutilated sculptures are found inside. in elevation, the temple has an austere Adhishthana in the region of the pillared Mandapa. The Jagati is provided with Kakshasana. Exterior is similar to Bankapur's Nagaresvaragudi. What stands out in this statue is the jewelry. The crown is stylish. Notice the size of the ear rings. I wonder how clearly the details were when this was created. One needs a strong neck to carry such weight attached to the head. An object placed the head feels very different from having it fixed to the head. The 32-pillared Mukhamanadapa. Fluted pillars on the outside are similar to pillars of Bankapur's Nagaresvaraudi and haveri's Purasiddeshwara. 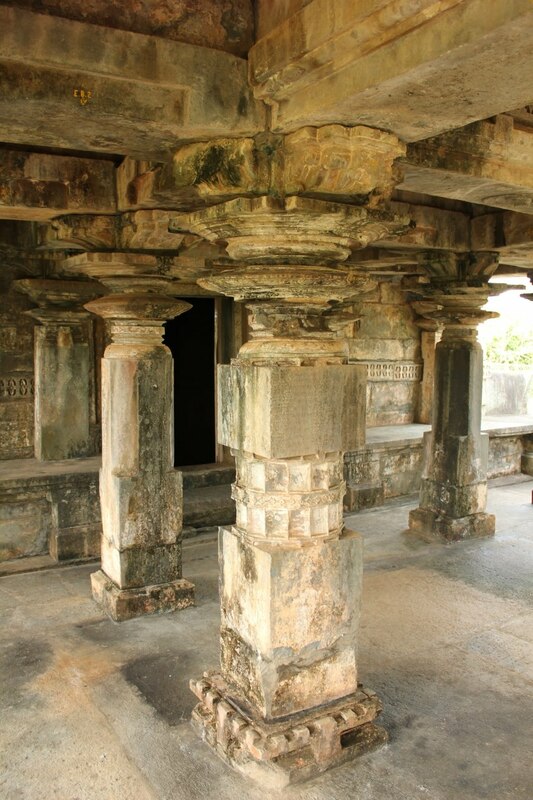 Few of the inside pillars have inscriptions and matrices, both rectangular and circular. A close at one of the inscriptions. The matrices- each cell has one letter. This is something I've not seen else where. What does this represent? A calendar? 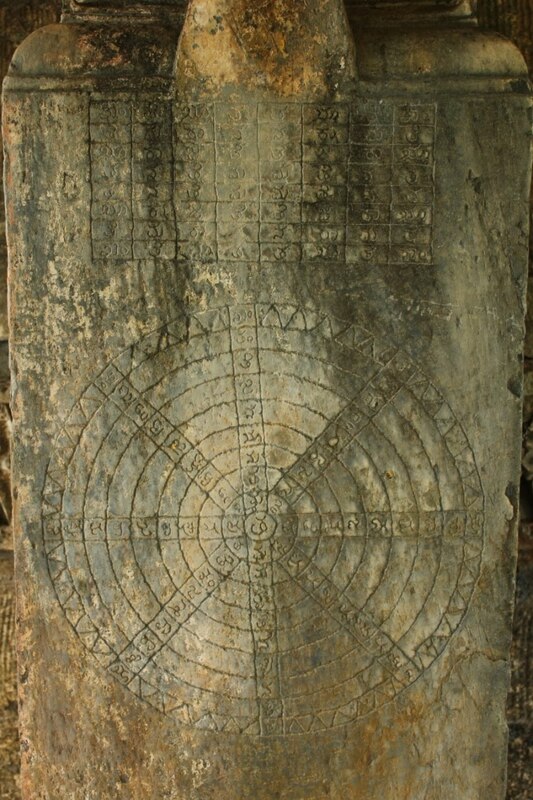 An astrological table? 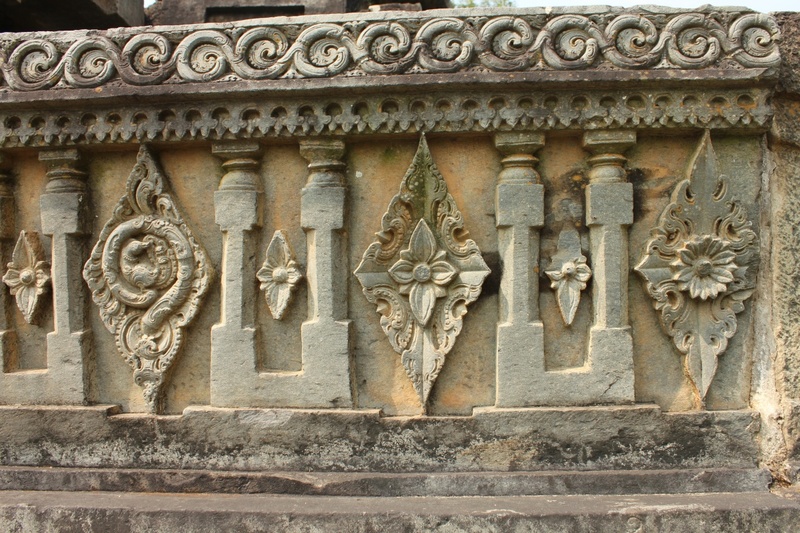 The stones seem to be softer compared to the stones used in temples of Bankapur and Balligavi. Nice color. I think some type of fungus is the reason for the color. Such beautiful creation! And nature gives it a touch of its own. 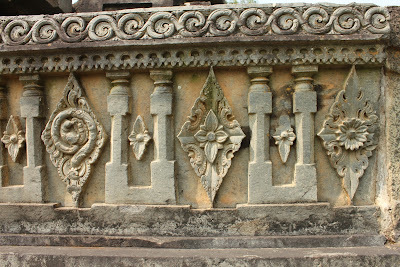 Close ups of floral designs on the front portion of the temple. Slender girls dancing and playing a drum. I feel this image is flawed ...the girl's right leg does not have proper shape. A plump man and a couple doing gymnastics. I was happy to see the temple. If I had missed the care-taker, I would have missed seeing this beautiful little temple and its unique matrices. While I was at the Basdi, Yellppa jacked up the car then realized the wheel spanner was missing. Since the tire was not really flat, we decided to drive on and have it mended on the way. No luck in any of the villages we passed through. Finally after a 30 minute drive to Siralkoppa, we found a tire shop just as we entered the town. 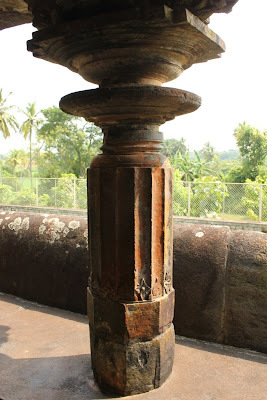 Once the tire job was fixed, we found a Khanavali, if not for place's dungeon like appearance, food might have tasted better. Anyway, our hunger was taken care of. As we drove Yellappa and I spoke about the varieties of crops grown in this region- pineapple, ginger and paddy ...even as I spoke I was little worried that we might reach Chandragutti too late. Lovely temple , thanks for sharing . I'm not sure how I missed this blog all these years. You open up a lot of smaller unknown places for us. Very impressed with the consistent posting over the years as well. One day I'll finish reading all the posts :). Nice Descriptions and Photos. 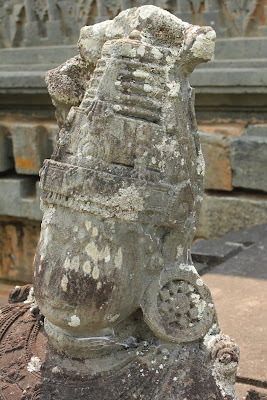 Your blog have a treasure of heritage temples and all. Thanks to you. One question about Shantinath basadi, Bandalike is: Is there any main image of diety there still exists in temple? I mean to say - is there performed daily rituals these days? @ Manish - I did not see signs of rituals being carried out.